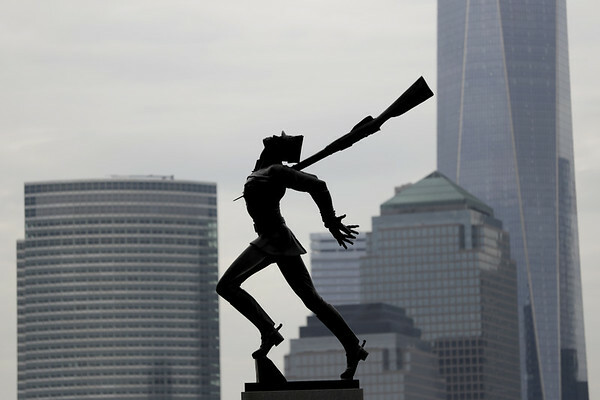 JERSEY CITY, N.J. (AP) - An acrimonious battle in New Jersey over plans to move a waterfront statue commemorating the 1940 massacre of Poles has ended. Jersey City Mayor Steve Fulop and local Polish groups announced late Saturday that they have reached an agreement on relocating the Katyn Memorial. Details on the deal will be announced today. City officials wanted to move the statue as part of a renovation of the plaza where it currently stands, on the waterfront across from downtown New York City. The head of the group organizing the renovation has called the statue “gruesome” and has said he prefers that it get a new home, according to published reports. But the Polish groups opposed that and had sought a court order in recent days to block the move. The bronze statue depicts a Polish soldier bound, gagged and impaled by a bayonet. It sparked strong emotions in Poland, where Katyn is remembered as one of the worst tragedies to befall the nation in a long tragedy-filled history. The plans to remove the statue have been a top news story in Poland in recent days, where many feel that it is revenge for the passage earlier this year of a Polish law that makes it a crime to blame Poland for any of the Holocaust crimes committed by Nazi Germany. The Polish government said Sunday it’s pleased an agreement has been reached, but declined comment on it. A Jersey City spokeswoman declined to elaborate on Fulop’s tweet. Posted in New Britain Herald, Nation-World on Sunday, 13 May 2018 20:18. Updated: Sunday, 13 May 2018 20:21.